Fenzi North America is pleased to announce that we have added to our product line with our “MOLVER MGM 01” molecular sieve desiccant. Distributed thru Europe by FENZI Italy for upwards of 8 years, we are now stocking a ‘North American Approved’ 3A product, for use in your insulated glass production. This molecular sieve desiccant can provide the insulated glass industry with the comprehensive functions of high adsorbent ability to water content as well as low dust index. This product can be used in any insulated glass system that is sealed with polysulphide. Fenzi MOLVER MGM can be used in the processing of sealed system with low-level solvent. 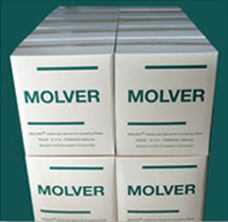 MOLVER MGM 01 has a very long lifetime due to its low adsorption of air. Because of its low level of air adsorption, it can reduce, to a large degree, stress and bending of the glass. We carry in stock both the larger beads (55 Lb boxes) for manual fill and the smaller bead size ( 331Lb) for automatic filling machines. Material Safety Data Sheets can be obtained by calling Fenzi Customer Service at 416-674-3831 or via email at info@fenzi-na.com. Fenzi desiccants are available in 3 sizes (0.5-0.9; 1.0-1.5 and 1.5-2.0). Please contact our Order Desk at orders@fenzi-na.com.